We also discuss move-look support for touch devices, with the move controller defined as the lower-left section of the screen that behaves like a directional input, and the look controller defined for the remained of the screen, with the camera centering on the last place the player touched in that area. If this is an unfamiliar control concept to you, think of it this way: the keyboard (or the touch-based directional input box) controls your legs in this 3D space, and behaves as if your legs were only capable of moving forward or backward, or strafing left and right. The mouse (or touch pointer) controls your head. You use your head to look in a direction -- left or right, up or down, or somewhere in that plane. If there is a target in your view, you would use the mouse to center your camera view on that target, and then press the forward key to move towards it, or back to move away from it. To circle the target, you would keep the camera view centered on the target, and move left or right at the same time. You can see how this is a very effective control method for navigating 3D environments! These controls are commonly known as WASD controls in gaming, where the W, A, S, and D keys are used for x-z plane fixed camera movement, and the mouse is used to control camera rotation around the x and y axes. Add basic move-look controls to your DirectX game for both mouse and keyboard, and touch screens. Implement a first-person camera used to navigate a 3D environment. For touch controls, we implement two controllers: the move controller, which handles movement in the x-z plane relative to the camera's look point; and the look controller, which aims the camera's look point. Our move controller maps to the keyboard WASD buttons, and the look controller maps to the mouse. But for touch controls, we need to define a region of the screen that serves as the directional inputs, or the virtual WASD buttons, with the remainder of the screen serving as the input space for the look controls. Our screen looks like this. When you move the touch pointer (not the mouse!) in the lower left of the screen, any movement upwards will make the camera move forward. Any movement downwards will make the camera move backwards. The same holds for left and right movement inside the move controller's pointer space. Outside of that space, and it becomes a look controller -- you just touch or drag the camera to where you'd like it to face. First, we must create our control class that we use to handle input events from the mouse and keyboard, and update the camera perspective based on that input. Because we're implementing move-look controls, we call it MoveLookController. Now, let's create a header that defines the state of the move-look controller and its first-person camera, plus the basic methods and event handlers that implement the controls and the update the state of the camera. Our code contains 4 groups of private fields. Let's review the purpose of each one. First, we define some useful fields that hold our updated info about our camera view. m_position is the position of the camera (and therefore the viewplane) in the 3D scene, using scene coordinates. m_pitch is the pitch of the camera, or its up-down rotation around the viewplane's x-axis, in radians. m_yaw is the yaw of the camera, or its left-right rotation around the viewplane's y-axis, in radians. m_moveInUse indicates whether the move controller is in use. m_movePointerID is the unique ID for the current move pointer. We use it to differentiate between the look pointer and the move pointer when we check the pointer ID value. m_moveFirstDown is the point on the screen where the player first touched the move controller pointer area . We use this value later to set a dead zone to keep tiny movements from jittering the view. m_movePointerPosition is the point on the screen the player has currently moved the pointer to. We use it to determine what direction the player wanted to move by examining it relative to m_moveFirstDown. m_moveCommand is the final computed command for the move controller: up (forward), down (back), left, or right. Now, we define the fields we use for our look controller,- both the mouse and touch implementations. m_lookInUse indicates whether the look control is in use. m_lookPointerID is the unique ID for the current look pointer. We use it to differentiate between the look pointer and the move pointer when we check the pointer ID value. m_lookLastPoint is the last point, in scene coordinates, that was captured in the previous frame. m_lookLastDelta is the computed difference between the current m_positionand m_lookLastPoint. m_forward, m_back, m_left, m_right, m_up and m_down. OnPointerPressed. The player pressed the left mouse button with the pointer in our game screen, or touched the screen. OnPointerMoved. The player moved the mouse with the pointer in our game screen, or dragged the touch pointer on the screen. OnPointerReleased. The player released the left mouse button with the pointer in our game screen, or stopped touching the screen. OnKeyDown. The player pressed a key. OnKeyUp. The player released a key. And finally, we use these methods and properties to initialize, access, and update the controllers' state info. Initialize. Our app calls this event handler to initialize the controls and attach them to the CoreWindow object that describes our display window. SetPosition. Our app calls this method to set the (x, y, and z) coordinates of our controls in the scene space. SetOrientationOur app calls this method to set the pitch and yaw of the camera. get_Position. Our app accesses this property to get the current position of the camera in the scene space. You use this property as the method of communicating the current camera position to the app. get_LookPoint. Our app accesses this property to get the current point toward which the controller camera is facing. Update. Reads the state of the move and look controllers and updates the camera position. You continually call this method from the app's main loop to refresh the camera controller data and the camera position in the scene space. Now you have here all the components you need to implement your move-look controls. So, let's connect these pieces together. These events are implemented on the CoreWindow type. We assume that you have a CoreWindow object to work with. If you don't know how to obtain one, see How to set up your Windows Store C++ app to display a DirectX view. As these events fire while our app is running, the handlers update the controllers' state info defined in our private fields. First, let's populate the mouse and touch pointer event handlers. In the first event handler, OnPointerPressed(), we get the x-y coordinates of the pointer from the CoreWindow that manages our display when the user clicks the mouse or touches the screen in the look controller region. // Change the values  to percentages of the preferred screen resolution. This event handler checks whether the pointer is not the mouse (for the purposes of this sample, which supports both mouse and touch) and if it is in the move controller area. If both criteria are true, it checks whether the pointer was just pressed, specifically, is this click unrelated to a previous move or look input, by testing if m_moveInUse is false. If so, the handler captures the point in the move controller area where the press happened and sets m_moveInUse to true so when this handler is called again it won't overwrite the start position of the move controller input interaction. It also updates the move controller pointer ID to the current pointer's ID. 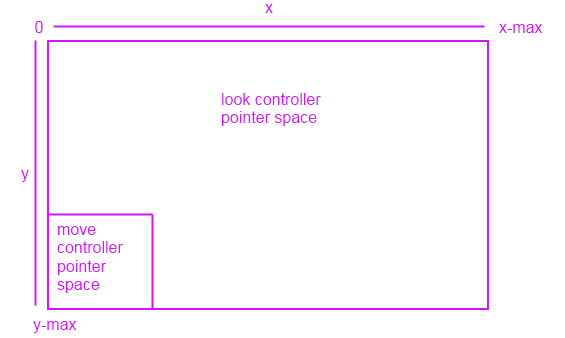 If the pointer is the mouse or if the touch pointer isn't in the move controller area, it must be in the look controller area. It sets m_lookLastPoint to the current position where the user pressed the mouse button or touched and pressed , resets the delta, and updates the look controller's pointer ID to the current pointer ID. It also lets sets the state of the look controller to active. The OnPointerMoved event handler fires whenever the pointer moves (in this case, if a touch screen pointer is being dragged, or if the mouse pointer is being moved while the left button is pressed). If the pointer ID is the same as the move controller pointer's ID, then it's the move pointer; otherwise, we check if it's the look controller that's the active pointer. If it's the move controller, we just update the pointer position. We keep updating it as long the PointerMoved event keeps firing, because we want to compare the final position with the first one we captured with the OnPointerPressed event handler. If it's the look controller, things are a little more complicated. We need to calculate a new look point and center the camera on it, so we calculate the delta between the last look point and the current screen position, and then we multiply versus our scale factor, which we can tweak to make the look movements smaller or larger relative to the distance of the screen movement. Using that value, we calculate the pitch and the yaw. Finally, we need to deactivate the move or look controller behaviors when the player stops moving the mouse or touching the screen. We use OnPointerReleased, which we call when PointerReleased is fired, to set m_moveInUse or m_lookInUse to FALSE and turn off the camera pan movement, and to zero out the pointer ID. So far we handled all the touch screen events. Now, let's handle the key input events for a keyboard-based move controller. As long as one of these keys is pressed, this event handler sets the corresponding directional move state to true. And when the key is released, this event handler sets it back to false. When we call Update, it checks these directional move states, and move the camera accordingly. This is a bit simpler than the touch implementation! Let's hook up the events now, and initialize all the controller state fields. Initialize takes a reference to the app's CoreWindow instance as a parameter and registers the event handlers we developed to the appropriate events on that CoreWindow. It initializes the move and look pointer's IDs, sets the command vector for our touch screen move controller implementation to zero, and sets the camera looking straight ahead when the app starts. Let's define some methods to get and set the position of the camera with respect to the viewport. Now, we perform our calculations that convert the pointer coordinate info tracked in m_movePointerPosition into new coordinate information respective of our world coordinate system. Our app calls this method every time we refresh the main app loop. So it is here that we compute the new look point position info we want to pass to the app for updating the view matrix before projection into the viewport. When we compute the velocity, we also translate the coordinates received from the move and look controllers into the movement of the actual look point we send to the method that computes our view matrix for the scene. First, we invert the x coordinate, because if we click-move or drag left or right with the look controller, the look point rotate in the opposite direction in the scene, as a camera might swing about its central axis. Then, we swap the y and z axes, because an up/down key press or touch drag motion (read as a y-axis behavior) on the move controller should translate into a camera action that moves the look point into or out of the screen (the z-axis). The final position of the look point for the player is the last position plus the calculated velocity, and this is what is read by the renderer when it calls the get_Position method (most likely during the setup for each frame). After that, we reset the move command to zero. Congratulations! You've implemented basic move-look controls for both touch screens and keyboard/mouse input touch controls in Windows Store C++!